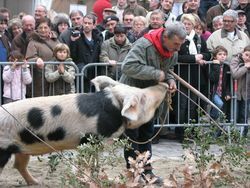 Regional channel TV Sud has dedicated a 3-part programme to Uzès. This is the first of 3 (PART 1) videos on the city’s history and the story behind Uzès’ special treat: Haribo’s Sweet Factory and Museum! In the second film (PART 2), we learn about Uzès, the horse and the truffle! And finally in the third instalment (PART 3) of TV-Sud’s take on Uzès, we are taken on a guided tour of the Ducal Palace and get a glimpse of France’s only artisanal coffee roaster!